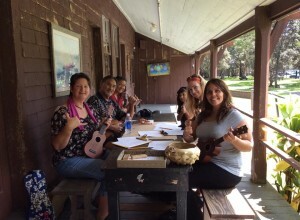 Aloha Friday cultural demonstrations are held each week from 11 am – 1 pm on the porch of Volcano Art Center Gallery in Hawai‘i Volcanoes National Park. This week’s offerings include: Ukulele with Wes Awana. Volcano area musician Wes Awana shares his love of ‘ukulele and Hawaiian music by giving family-friendly lessons on the iconic and inviting ‘ukulele.